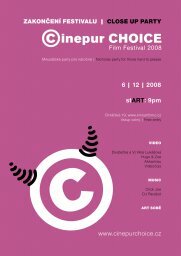 Cinepur CHOICE festival in Brno will end on Saturday night with a St. Nicoals Party for demanding audience – in cinema Art, Cihlarska street, starting at 9pm. The entrance is free and the party till the morning hours. Cinema Art brings thus some presents to its faithful audience and to itself; we’ve stopped getting St.Nicolas cookies since the first high-school acne appeared on our faces.